Saint Patrick’s Day fever is upon us again with everything from hairstyles to world landmarks being turned green to celebrate all things Irish (and indeed, the Welshman’s legacy). Last week, we shared with you a look at our Leprechaun video greeting, covering the process from concept through storyboarding, then from modelling to rigging and skinning. We continue on from there with the next stage; Animation. The Leprechaun character (we’ve been calling him Larry!) needs to be animated at first sliding down the rainbow and into the pot of gold. Using the rig we set up earlier, we keyframe his movement so that he appears to roll himself into a ‘cannonball’ for his big splash! After his splashdown, Larry emerges from the pot of gold gives a wave and a chuckle. Again, this movement is keyframed; the waving back and forth of the hand and the shrugging of his shoulders are animated frame by frame. A clever option for animating the face is through the use of morph targets, which are deformed versions of a shape. Applied to Larry’s face, his head is first modelled with a neutral expression and a “target deformation” is created for each other facial expression (smile, raised eyebrows, winking, etc), allowing the animators to morph (or “blend”) between the base shape and one of several morph targets. A particle system is the engine that usually drives effects like smoke, rain, fire, and other phenomena that require a large number of small moving objects. In this case, we use a particle flow system applied to the gold coins within the pot of gold. This allows us to simulate real-world physics and forces like gravity or wind. We can set up collisions and give the coins real-world physical values, so that when Larry collides with them, they behave accordingly. An easier example of this would be to hurl a bowling-ball down it’s lane, hitting the pins at the end and knocking them over. Using particle flow saves an enormous amount of time keyframing each individual object, producing instant results that can be modified in real time. Now that all of the 3D elements and animations are complete, they need to be composited together so that each element works in unison and we can finally begin to work on the personalised greeting appearing on screen. 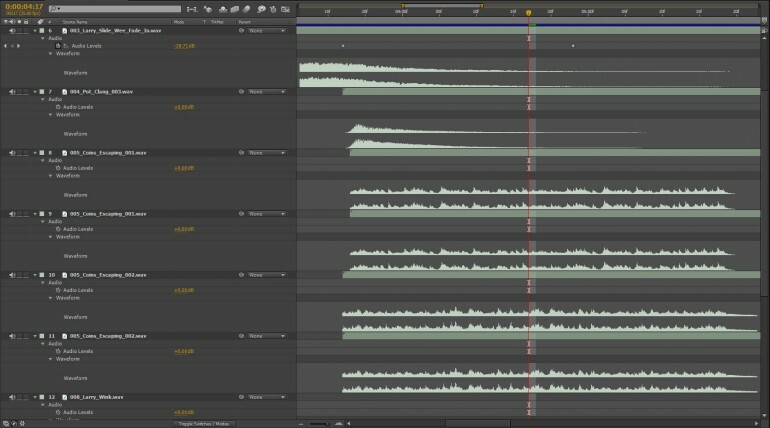 The clouds from the beginning of the video are animated in the compositing stage, to save on render time at the modelling stage. The text that appears is also created here, along with the (glitter and bounce) that we see in the video. 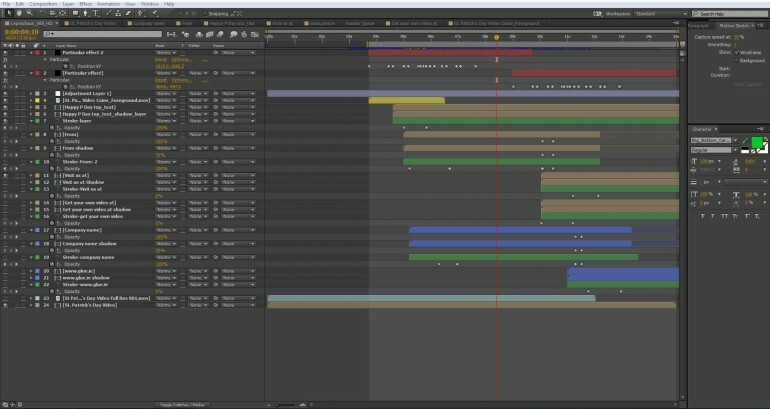 Custom music is made and sound effects are then added to the scene, giving extra life and depth to Larry. He’s a mischievous little creature, so it’s essential that his voice and actions convey this. Once all of these elements are edited together and balanced, the greeting is ready to be personalised. The greeting can be entered through our website, for your own personal video greeting click here. Alternatively, if you would like a card for your business with your companies website in the video then click here. 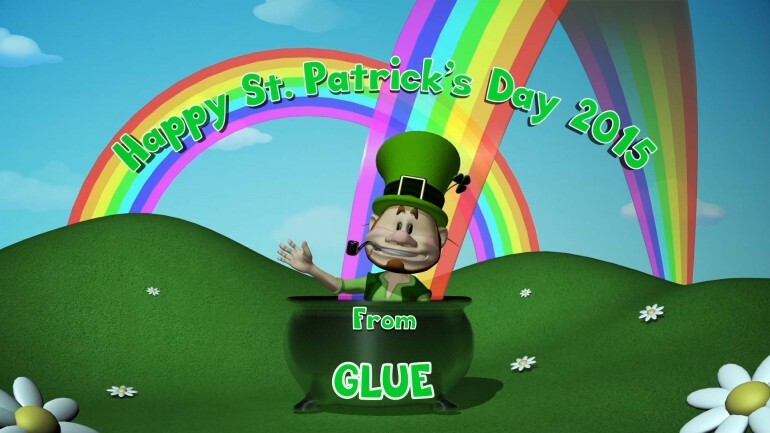 As a little reward for checking in on us at GLUE we would like to reward those going for the business video card with a €24.99 discount code, just enter card25 into the coupon box on our website. After you give us the greeting you would like we then take the video and customise it to suit, generating a video link which you can share with friends, family and clients via email or on your favourite social media sites! It can be embedded into your own website to add that special, personal touch! There are some sites online that offer similar services, but we can proudly say that there are none that provide this level of care and attention to detail! We do hope you enjoy the video and we want to wish you a very Happy St. Patrick’s Day!